Many of things I write about in this column are inspired by emails that I receive from readers, messages you send me via the various social media networks or the comment threads on the website and forums. It’s a formula that’s always served me well, but this month’s topic was decidedly less electronically inspired – what follows is the result of being accosted while queuing for what passes as a latte in a well-known American coffee chain. There I was, minding my own business and awaiting my pint of four-shot, low-fat brown liquid when suddenly an irate man came up and started berating me, accusing me of writing rubbish in this column. There was no “Excuse me, are you the chap who writes for PC Pro?”; no “I wonder if you could help me with something that you wrote about?”. He went straight into a mega-rant about how I’d recommended powerline networking as a good alternative to Wi-Fi, and how he’d gone out and bought the kit on my recommendation, yet it hadn’t worked. I’ll have to admit that my first instinct was “this bloke’s a nutter”. But it turns out my ranty man wasn’t like that at all. Beneath the red face and close-to-exploding neck veins, he was actually quite rational – and genuinely quite upset. It turns out he runs a small factory-cumworkshop housed in an ancient building, and over the years he’s struggled with data networking. Since he only leases the property he isn’t allowed to drill holes in the walls and ceilings to install a wired network, and since these walls are really thick, Wi-Fi reception is fairly flaky. He’d read my advice about using HomePlug kit in such situations and then spent several days tearing his hair out being unable to make it work. At this point I did what any self-respecting coward would do – rather than stand up to his insults and defend my advice, I offered to pay for his coffee, sat down and chatted through his problems. (I almost ordered him a decaf; I was worried that a couple of shots of espresso might set him off again – luckily, he remained calm.) He explained how he is sporadically upgrading the various moulding and milling machines in his factory, and that the newer models almost always need some form of data network connection, without which he has to run around the factory plugging a laptop into each machine in turn to download designs – hardly a productive way to work. After a few minutes chatting to him, his problem became obvious – or rather, I thought it did. His factory was fed by a three-phase supply and so if different bits of kit were plugged in on different floors of the building, they’d probably turn out to be on different phases. Just in case you don’t know, the 240V mains electricity supply to your home is probably 120 degrees (one-third of a cycle) out of phase with your neighbour’s supply, and a further 120 degrees from the house next door to them. There are numerous generation and transmission benefits to running a three-phase system in this way. But although domestic properties and small offices will be fed by a single one of these phases, larger offices and factories typically take a feed from all three of the phases – in fact, much factory machinery (and on the IT side, many big UPS units) require three-phase current. Since HomePlug was primarily designed to be used in the home (it says so on the tin), there isn’t usually anything in the manual to warn you that the system won’t work in a building with more than one mains phase. The problem is that the three phases are usually quite separate, with no physical connection between them within the building, so if you impose a HomePlug signal onto one of the phases, it can’t be heard on either of the other two. I explained all of this patiently to my now-calmer companion, and he went away to experiment with plugging his HomePlug units into different sockets. Phew, another happy reader! Well, actually, no – because this story has a part two. 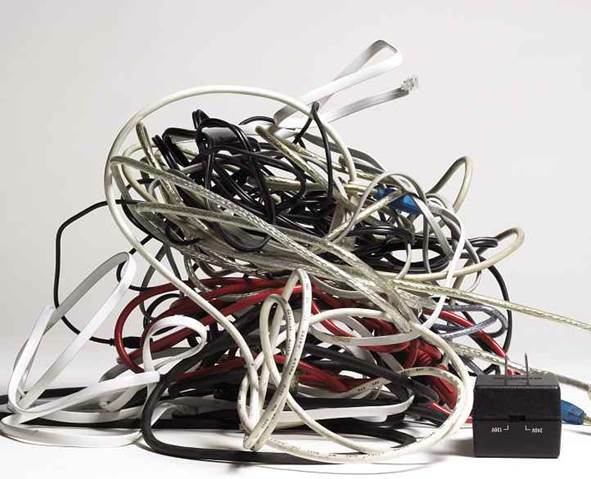 I bumped into the same chap a couple of days later and he said he was still having problems: all of his powerline networking adapters were now on the same phase, and when the factory shut down he could communicate between his CAD suite and the workshop machine controllers. But as soon as some of the heavy plant fired up, the HomePlugs lost their signal. It was immediately obvious to us both that the problem was mains-borne noise, and that perhaps HomePlug units weren’t the right solution for him. 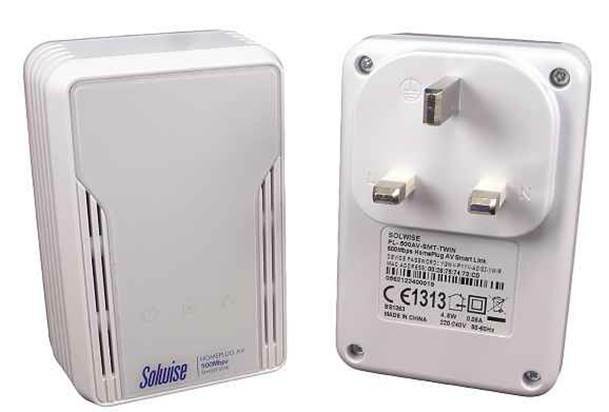 By pure luck, though, that very morning – honestly, I’m not making this up – a parcel had arrived from the nice people at Solwise, containing a sample pair of its new SmartLink-based powerline networking adapters, which are designed specifically for noisy environments such as his. The NET-PL-500AV-SMT adapters, to give them their full name, use a relatively new chipset from Atheros that’s designed to combat noisy mains. Where a normal HomePlug unit transmits signals via the live and neutral wires within the mains cable, these new SmartLink adapters can switch to employ live and earth instead. The live wire (or “line” for our international readers) is always going to be noisy in a factory environment, but the earth wire will often be a little quieter than neutral. The switching is done automatically – there’s no need to configure anything. To be honest, I was a little sceptical – surely the things are still connected to the live wire, and that’s still going to be crackling with noise – but my new-found friend and his factory would give me the opportunity to do a proper real-world test on these units. And you know what? Much to my surprise, they did make a difference. It isn’t a complete solution – throughput still dropped whenever the machines started up – but the SmartLink units at least kept the connections alive rather than dropping them. We discovered that, although these units can talk to other HomePlug AV adapters, to use their Smart Link feature you need all the adapters in the network to support it: as soon as you introduce one non-SmartLink device it seems to lock all of the adapters into using live and neutral. This wasn’t exactly clear from the documentation, but knowing how the units work it’s hardly a surprise. I normally like to give products and services a real-world workout, but this turned out to be a bit more real-world than normal, all thanks to an encounter with a red-faced man in a coffee shop. Finally, just so that you don’t think I’m being mean, I should end by telling you that I’ve shown him this part of the column and he laughed, saying he’s more than happy for me to print the story exactly as written, so long as I don’t mention him by name. What a great sport!